Subtitled Music for Dance vol 2, Allies is an album with a curious history. The music was originally commissioned and recorded in 1989 with George Cartwright (alto sax) and Tom Cora (cello) of Curlew, both regular Frith collaborators, Frith using a programmable drum machine alongside his regular arsenal of guitar, violin, bass and keyboards. The music remained unreleased for several years, and when it was finally scheduled to emerge as an album Frith decided he was unsatisfied with the drum sound and invited Naked City sticksman Joey Baron to re-record the drum parts. 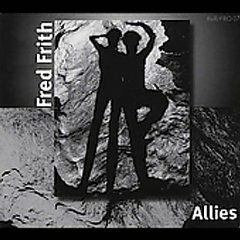 The result is one of Frith's most enjoyable albums. Although he has worked successfully in many different musical contexts, he's usually at his best composing for a small ensemble; think of Henry Cow, Art Bears and the Gravity and Speechless albums. The arrangements here are comparatively sparse, and themes recur and mutate throughout the six pieces. The musicians weave in and out of the music as required, with Tom Cora's cello frequently underpinning things alongside Joey Baron's low key drumming - it's only really on two pieces that he plays anything close to a straightforward beat, and then only briefly - with George Cartwright's sax intervening, embellishing or gently tugging the music into a different direction. Frith adds some unpredictable guitar lines, washes of keyboard and occasionally picks up his violin to double up with Tom Cora. Although the music is deceptively simple there's a lot going on below the surface; it's rarely discordant, but melodies never resolve in a predictable manner, and as important as the rhythm is the beats rarely fall where you'd expect them to. Despite nominally being divided into six tracks, it's more like one continuous 40 minute composition in six sections. These are still strong enough to function as stand alone works; two of them also crop up on the excellent live retrospective Keep the Dog. The overall feeling here is closer to chamber rock than to any other style, and fans of A Silver Mt Zion and similar bands may find it enjoyable, as will any RIO/Avant afficianados. One of Frith's gentler and more accessible releases, but also an album of great depth that rewards attentive listening.